by Eileen Torgersen-Smith – A love story written as a series of letters written in 1940 and published as a trilogy. Despite the horrible backdrop of a looming World War Two, the wonderfully sweet romance between Art and Sally unfolds. Art is a traveling salesman in northeastern North Dakota. Sally is an elementary school teacher in Fargo, where she resides in an apartment at Hotel Fargoan. 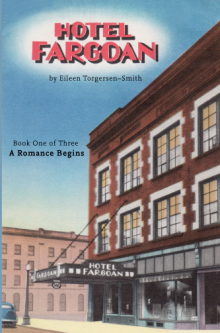 Order the Hotel Fargoan trilogy from your favorite bookstore or Amazon.com.